Legendary American band Styx announce Exclusive UK show for June 2019. 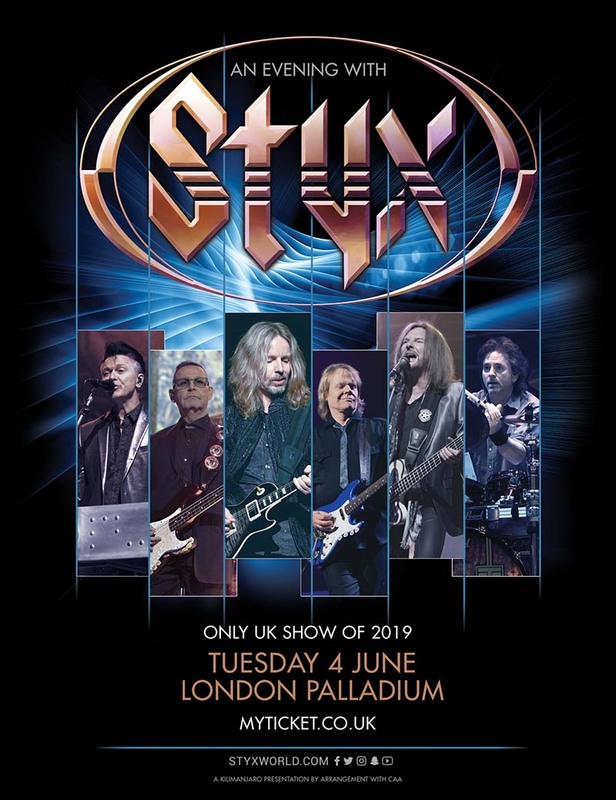 Styx bring their only UK show in 2019 to the prestigious London Palladium on the 4th June for “An Evening Of Styx.” They will perform music to celebrate their hugely successful 47-year career, including tracks from their most recent studio album The Mission. The band have been a staple of “Rock radio” playlists throughout this time, with songs including Crystal Ball, Come Sail Away, Lorelei, Blue Collar Man, Renegade, The Grand Illusion, Too Much Time On My Hands and Fooling Yourself (The Angry Young Man). This will be the first time Styx have headlined their own show in the UK since 2005 and their first performance since their co-headlining tour with Journey and Foreigner in 2011. You may also like: Toto.